In the second game for the Southwest Sunscreen Division, both teams come in with stellar reputations. It’s Vanicream Sunscreen Sport vs Blue Lizard Australian Sunscreen in a battle for fun in the Sun supremacy. Do You Want the FAVORITE to Win this Game? 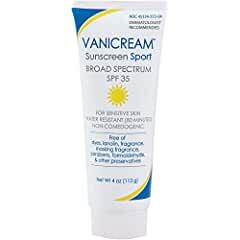 Vanicream Sunscreen Sport comes from the PSI ownership family. PSI has created the Vanicream brand and has built quite a following from both teams in the Lotion Challenge League. 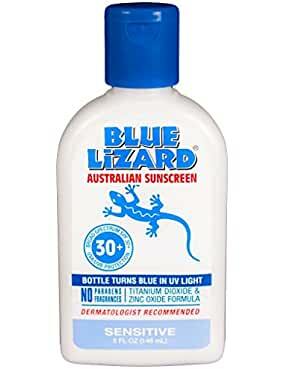 Blue Lizard Australian Sunscreen comes from Down Under where Sun can be just as brutal as in the US. This team has won awards from prestigious organizations like the EWG (Environmental Working Group). The Southwest Sunscreen Division’s second game of the Lotion Challenge season should come right down to the wire as both teams have top of the line quality talent on their teams and they make few mistakes. Will the Vanicream brand continue putting quality play onto the field and come out on top? Or, will the the Australian talent eat up Vanicream like Shrimp on the Barbie? This Vanicream Sunscreen Sport roster is focused and talented from top to bottom. The Blue Lizard Australian Sunscreen team has a quirky team. But, make no bones about it, the talent runs as thick as Deep South country gravy. Blue Lizard Australian Sunscreen wins the coin toss and will receive the opening kickoff. As the Blue Lizard Australian Sunscreen coach watches the kickoff travel into the endzone where it was downed, the coach contemplates his first move. The BL coach chooses Chlorphenesin as his opening play. Chlorphenesin is a natural born killer (of fungus, bacteria and other microbes). This funtion allows the BL team to stay safe from those microscopic leaches that try to age the team. In other words, Chlorphenesin acts as a preservative of the team. Chlorphenesin has also had some bad press. Particularly in Japan where it’s use is restricted to lower concentrations. Chlorphenesin starts the drive off at RB and takes the handoff. With the inside holes blocks, Chlorphenesin tries to bounce the play outside and is unable to make the corner for a 1 yard loss. On 2nd down, Chlorphenesin lines up at RB again, and drifts to the left as the pass play develops. The Blue Lizard QB works through his progressions and with no one open, Chlorphenesin receives the outlet pass. Chlorphenesin tries to blast the LB with a bull run, but the Vanicream defense loaded up on defensive microbes and is able to bring down Chlorphenesin after a 4 yard gain. This brings up a 3rd down and 7. Chlorphenesin goes into motion with the BL QB in the shotgun. At the snap, Chlorphenesin cuts up field and fakes outside, and then turns inside. The pass is quick and on target, but Chlorphenesin is immediately paralyzed by the defense and Chlorphenesin is stopped short of the first down by a yard. Not taking any chances this deep in their own territory, Chlorphenesin punts the ball deep. The Vanicream returner catches the ball on the run and is able to make the first wave miss as he turns up field. The fakes to beat the first wave cause the Vanicream returner to run out of bounds after a 9 yard return. The Vanicream Sunscreen Sport coach was very proud of his defense on the last drive, and is looking to take advantage of the momentum swing. Coach binds Tridecyl Neopentanoate to the offense to see what this skin conditioning agent can do. TriNeo has been known to help skin stay soft. So, is a valuable player for the Vanicream team. TriNeo emmollient talents are feared by defenses throughout the Lotion Challenge league. TriNeo combines its skin conditioning talents with binding properties. This make TriNeo especially dangerous because once TriNeo makes it onto skin, he latches on and defenses can’t do anything about it. Starting off the drive from the Vanicream’s own 36 yard line, TriNeo takes the bal with a sweep around right end. The Blue Lizard defense is able to keep TriNeo from binding to it’s skin and holds TriNeo to a 1 yard gain. The Vanicream coach sees something about that last play and goes right back to it. This time TriNeo sees the play develop much better and binds to his blockers who lay a path around right end and into the secondary. TriNeo can’t be stopped and has to be pushed out of bounds. But, not until after a big 23 yard emulsifying gain. Lining up in the backfield, TriNeo goes in motion and the defense doesn’t know what to do. The safety cheats up in anticipation of a short pass. TriNeo runs a double move and the Vanicream tosses the ball up deep. TriNeo binds to the ball at the 20 yard line and the double move allows TriNeo to waltz into the endzone for a 40 yard TOUCHDOWN! The extra point (double oxygen C18H36O2 molecular training) is GOOD. The Blue Lizard Australian Sunscreen coach, looking to bounce back from the Vanicream score, sniffs out PEG-7 hydrogenated castor oil on the bench. Seven-Oil (as he’s know to teammates) has talents that include being a skin conditioning emollient and an emulsifying agent (is good a dispersing oils). One other lesser known skill (to those that watch 7-Oil on TV), is that Seven-Oil brings to his team is a pleasant fragrance. With the Vanicream kickoff sailing out of the end zone, Seven-Oil trots out to lead the team. Seven-Oil calls two emollient plays that go for no gain. But, the skin conditioning moves on the 2nd play cause Vanicream to try to grab a WR. That play draws a 5 yard penalty and a new set of downs. Going to an emulsifying play on the next play, Seven-Oil tries to disperse the oily defense. Seven-Oil slipped down field for 9 yards. Thinking Seven-Oil could slip foward easily for that one yard, the Vanicream coach sends in a soapy defender that washes the oils away. The smart play by the Vanicream coach results in two defensive stands that forces a 4th down. On 4th down, Seven-Oil really gets a leg into a punt that sail 51 yards in the air. The Vanicream return man is able to slip up field for 12 yards before being guided out of bounds. With an early lead and a defensive stop, the Vanicream Sunscreen Sport coach is looking to jump out to a big lead on the road. The perfect player to do that for coach is Polyethylene. PollyWantToCracker as he’s known to his teammates because of his big hits (and ability to crack opponents with them) and massive strength. PollyWantToCracker is very abrasive, is bulked up, stabilized emulsion, bind to anything within his grasp, increases viscosity, and is downright tough. Starting as their own 25 yard line, PollyWantToCracker shows his strength and bulk by dragging defensive players for a pair of 7 yard runs. After one of his lineman jumps offsides, PollyWantToCracker gets right back into the groove with 2 middle screens that he catches and burst up field for a huge gains of 29 and 25 yards. A little gassed from the previous 2 plays, PollyWantToCracker is stuff for a 2 yard loss on 1st down at the 12 yard line. But, he comes right back with another big 10 yard gain. This brings up 3rd and short at the 4 yard line, and the coach inexplicably calls play action to PollyWantToCracker and the QB throws a quick slant route that sails over everyones head to bring up 4th down. A dejected PollyWantToCracker settles in and punches the 22 yard FG through the uprights to extend the lead to 10. Blue Lizard wins the coin toss and will receive.